I feel exhausted, well I use too much of my energy lately, hehe. So rather than making something heavy for my supper, eating only a plate of salad will be great. 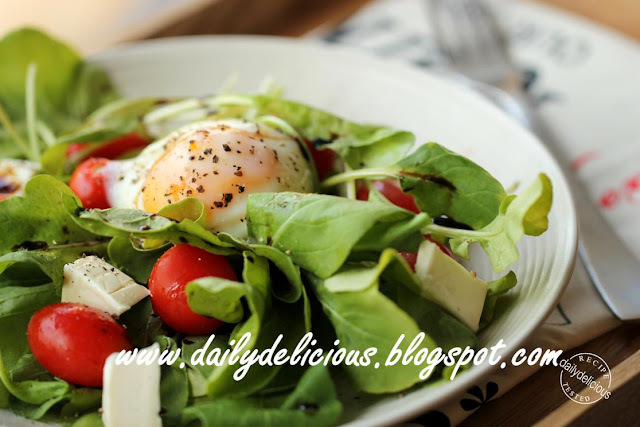 When thinking of salad, there are endless possibility, you can go for something simple or elaborate and you can be sure, it's not want I want now. So I just open the refrigerator, and try to find something to eat (Ok, you don't have to cry for me, I just too lazy to do anything much that's all, ^^"). I found a pack of baby rockets, a bag of cherry tomatoes and a box of laughing cow (for eggs, I always have them in my fridge, so I know that I have it!). I know that we don't use laughing cow as the salad ingredients but I think that the creamy taste of it is very delicious so why don't I use it! And the person who is going to eat is me, so it will be delicious for me at least, hehe. Anyway if I don't have laughing cow, I don't think cream cheese will work in this salad, the taste is too sour, I want some comforting taste. 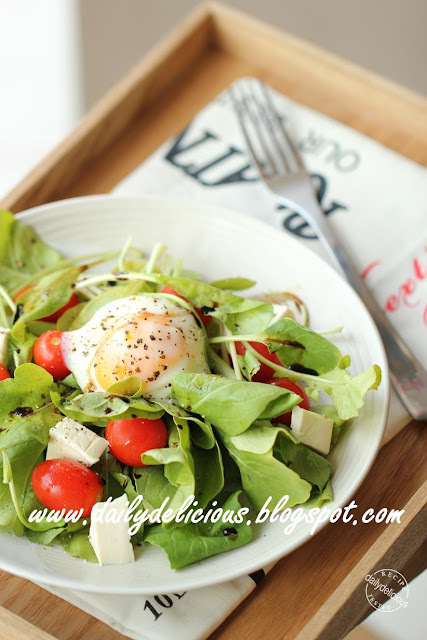 This salad is very easy to make, the only thing that will turn your salad down is the taste of the balsamic vinegar, if it's too sour (some international brand comes with sour taste and too strong aroma), combine it with a bit of brown sugar and warm it it the microwave for 10-20 seconds or until the sugar melt. Well, I know that it's not a traditional method but it will be great if you can make your ingredient more delicious. Luckily, I don't have to use that method for my balsamic ^^. *If you find poaching egg is too much, soft boiled egg will be great too. Wash and using the salad spinner to remove the water from the rockets. Put the rocket on the plate with cherry tomatoes (cut in half if they are big). Cut laughing cow into small pieces and sprinkle over the plate. Place the poached egg in the center, drizzle with balsamic vinegar, and sprinkle with salt and freshly cracked paper. Sit and eat it in front of TV, if you want, hehe.